It's been a while since I shared any of my favorite scans. Aunt Prudy passed away in July... and I'm still spending some time scanning and organizing photos. The scanning is quick. The dating and labeling takes longer. It's definitely a job... but it's a really enjoyable job for me when I find photos like these. 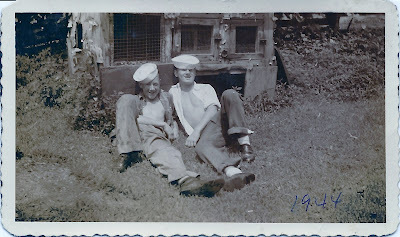 The back of this photo says "George & Wally - Life of Ease". George is Pop George (my grandfather) and Wally is his brother (my great-uncle). Pop George was 14 in 1944. Uncle Wally was 16 (? I think) I just love seeing them as boys just hanging out being boys. You don't usually think of your grandfather that way. 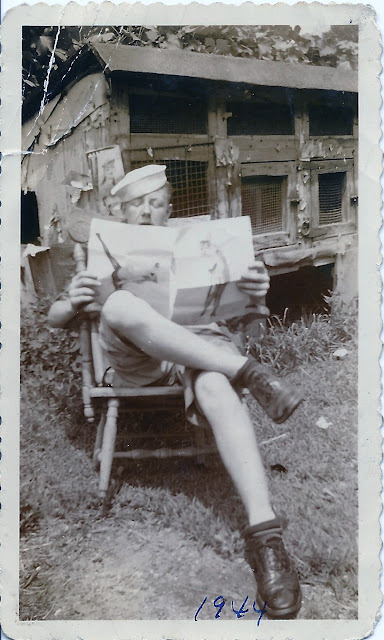 You don't tend to think of your grandfather "gazing at the Esquire pinup girls" either. But... that's what the back of this photo says. Love it. I just love it. 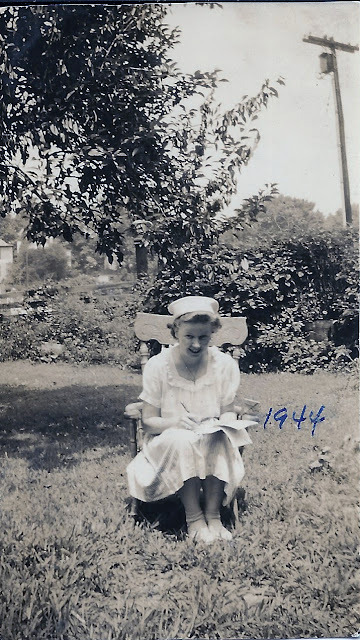 Taken on the same day, with the same chair, and the same hat... "Prudy writing a letter." Aunt Pru would have been almost 18 1/2 that summer. My one question... what was up with those hats?